Natural materials are elegant. Wood garage doors are not the exception. In fact, wood was the dominant material for panels until manufacturers started using metal as well. Still many homeowners prefer wood because it adds class and value to their home. If you take a closer look each panel is completely different and today, wooden doors come out in different colors as well. As a natural material, wood provides good insulation but not sufficient enough for very cold temperatures. The technicians of Homeland Garage Doors Toronto specialize on the requirements and peculiarities of wooden doors and they can take care of repairs and installation. 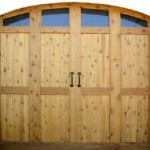 Wood garage door installation can be tricky because both parts look alike but they are not. Depending on your demands, the thickness of the door would vary. The thicker it gets the heavier it would be. In any case, we replace the springs and always varnish the panel with coatings for higher resistance. We have the experience and tools to take care of any problems and ensure your wood garage doors are stable.